Not long ago I interviewed Tracy Jones, who is a dancer with Corella Ballet in Spain. The Company were about to tour to the US for a week, performing at the New York City Centre. Their Artistic Director, Ángel Corella, was a Principal with American Ballet Theatre, and so very well-known to US audiences. In 2001, Spanish born Corella formed a Foundation to promote classical dance in Spain and to offer the opportunity for the finest professional training to all dancers, irrespective of background. After six years, the Corella Ballet was formed at the Royal Place of La Granja in Segovia, Spain. One of the ballets which the Company were due to perform was Christopher Wheeldon’s DGV -Danse à grande vitesse, which premiered in 2006 at the Royal Opera House, London, with Darcey Bussell famously in the principal role and partnered by Gary Avis. This was to be their New York premiere. 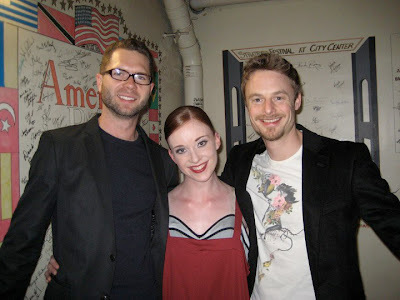 For DGV, Tracy was 3rd cast and had been rehearsing it with Chris Wheeldon. Tracy hopes that once the Company begin performing performing DGV more frequently, she may have a chance to do it, but for now she feels that it’s a privilege just to even learn it. The tour was a huge success, with great reviews. I caught up with Tracy once the tour was over, to find out more. What was your preparation for the New York tour ? The schedule at work was pretty busy in the last the few weeks before heading out to New York as we were rehearsing the rep that we were planning to do out there as well as premiering the company's Swan Lake for the first time. One of the ballets; Wheeldon's DGV was also a company premiere due to be performed in NY so it was tough trying to process all the information and get all the steps in to my head but we were lucky to have Jason Fowler and Chris himself working with us very closely throughout the process. What was your first impression on landing in New York (if this was your first visit)? I fell in love! It is such a wonderful city. We had been travelling all day and arrived in the evening, so we were pretty tried but I didn't want to waste any time out there. On the first evening, I already got to see some of the main sights I had planned on visiting. The jet lag didn't even get to me out there really as I was so full of adrenaline. What was the Company due to perform ? The company were due to perform String Sextet by Angel Corella, Solea by Maria Pages and DGV by Christopher Wheeldon at all the shows. In the evening shows, there were also two divertissements; Black Swan Pas de Deux and Walpurgisnach, and in the matinee, Epimitheus by company dancer Russell Ducker (Editors note : more from him later). What were you scheduled to dance and did everything work out as planned ? I performed Angel's String Sextet and DGV in each show and also performed in Epimitheus in the matinee show. Luckily for once, there was no drama during the week of shows. Normally there is always a situation where someone goes off sick or injured and a lot of people have to move around to compromise but we seemed to be lucky that week. We had been performing in Barcelona a few weeks before and the company was struck down with a virus so we had a lot of drama involving people moving around and jumping in, so I think karma was on our side for New York. Did you get to see the sights at all ? We were very lucky to actually have 3 days off during our time out there so I managed to see everything I wanted to see. It was Saint Patrick's day out there on the first day and being Irish, I really wanted to see the parade and join in on the festivities. I wasn't disappointed! Everything was green and the parade was great, in fact I think it might be even bigger there than in Ireland. I also managed to take a few classes at Steps on Broadway which was a really great experience. There were many dancers from New York City Ballet there at the same time including Wendy Whelan, Ashley Bouder and Maria Kowroski. They are all dancers I have watched and admired on youtube and videos so to take class with them was really great. Its also really refreshing to see and try a different style of dancing other than what I am used to. I did a lot of shopping too (maybe a little too much as I don't think my bank balance was very happy by the end of the week) and got to see some of the wonderful New York nightlife. I'm lucky to have a few friends living out there so it was great to see them, and to have good tour guides! What was the high point of the tour ? I think definitely the reception that we got from the audiences out there. On the first night, we finished the show to a standing ovation and there were so many people waiting outside to meet us afterwards. I think that as we are new company and it was our first International tour; a lot was expected but the audience seemed really enthusiastic and reviews were really positive which is always a good sign. One particular moment I loved was taking our curtain calls after the matinee show of Russell Ducker's Epimitheus. It is his first work for a company so to have it premiering at New York City Centre is a huge deal for him. I was so happy and proud of Russell when he took his bow as the audience really did go crazy for him. Russell and I have been friends since we joined White Lodge so it was really great to see him do so well and hopefully this will give him even more great opportunities. Now you are back in Spain, what’s next ? We are currently in rehearsal period here and have quite a number of shows coming up around Spain which is always nice, especially in the summer. Swan Lake is coming back into the programme in June which will be nice. I had my premiere of Big Swans in the last run we did, which was a pretty nerving but good experience, but of course as a dancer we are never entirely happy with everything so I'm looking forward to hopefully dancing that again and improving it. We also have some tours coming up including Italy and Mexico and have started rehearsing Raymonda so it looks like the next few months are going to be busy, but I'm really looking forward to travelling and hopefully returning to New York with the company again at some point in the future! It's nice to know that an accomplished ballet dancer such as Tracy Jones has a life besides dancing on stage, which includes touring a city like New-York with local friends as her guides. It seems she has really got a good time there, being lucky to 'fall' on the Saint Patrick's Day grand,green Parade. Yes, NYC and Ballet = Adrenalin! I always love these interviews as everyone is so different. Tracy seems fun as well as focused. DUTA - thank you ! Cloudia - Aloha. Bet you're having better weather ! Make Do Style - thank you so much ! Interesting! I'm not very familiar with the Corella, but am def about to do some Youtube research! What a busy girl :) Haha, I was also there in the city on St. Patrick's Day - except for me it was a pain to travel through the crowd just to get to class haha.